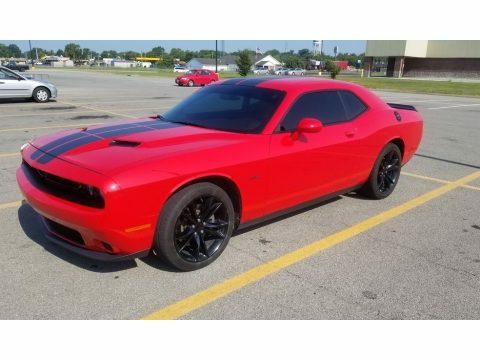 2016 Dodge Challenger R/T Blacktop Edition for sale in Harrisburg, IL 62946 Experience maximum driving pleasure behind the wheel of this 2016 Dodge Challenger R/T Blacktop Edition. This car has a 5.7 L Hemi 8-cylinder engine with a 6-speed automatic transmission. Shown here in a gorgeous Red exterior with a Black and Grey interior, this coupe is in excellent condition with only 2 owners. Power adjustable seats, cruise control and multi-zone climate control to add to the pleasing ride. Stay connected with Bluetooth, navigation, and XM Satellite Radio. Just imagine yourself gliding down the road in this stellar coupe and try to suppress a smile! Other Features Window Tint Custom Exhaust Aftermarket Air Intake Backup Camera Steering wheel controlsKeyless EntryRemote Start Seller’s Note: There are 3 small chips on front bumper Please call (402) 502-8385 for more information. ATTENTION BUYERS *Caveat Emptor* Please Remember to Inspect Vehicle Prior To Purchase!